Adding line dances to your wedding's playlist can help you get every guest out of their seats and on the dance floor. Playing one or more during your wedding can make your dance floor the hot place to be and your reception a memorable time. Due to their upbeat music or lyrics, several line dances are suitable for a wedding. Most wedding DJ's or bands will have the music to these songs but, if not, they can easily be downloaded. Although usually associated with the South, this line dance is suitable for a wedding located anywhere throughout the nation. Its popularity throughout the nation and easy dance moves make it suitable for any wedding. Robert Royston's Howcast video demonstrates that the dance's moves are simple, beginning with a stomp or touch, kick, and triple step performed in a circle. The dance can be performed in rows, with a partner, or individually. Music for this dance can be downloaded from Amazon. The lyrics for this song tell readers exactly what to do to dance to the song, and it topped the Wedj.com's list of Top 100 Popular Wedding Party Songs. Additionally, the music's beat allows dancers to show off their personal moves now and then. This makes it easy for any wedding guest to follow along and strut their individual dance style, making it perfect to play at your wedding. Mr. C's video shows the moves for the dance. The song can be purchased from Amazon. 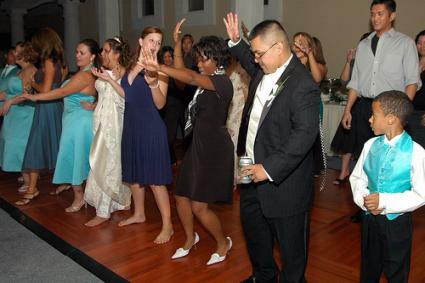 This popular line dance is often at the top of many DJ playlists for weddings; in fact, it was the second most popular song on Wedj.com's list. Its dance moves start with walks to the side followed by gentle kicks and a step-twist. The fact that the song's lyrics tell dancers what to do and that there are only three moves repeated in different directions during the song make it easy for all levels of dancers to follow along. Watch the official video from Atlantic Records featuring people doing the step to learn how to do the moves. The music for the dance can be downloaded from Amazon. This country music line dance contains music and lyrics that are so upbeat and fun that wedding guests throughout the nation won't be able to hold back when the song starts playing. The song itself hit number one on Billboard's Hot Country Songs List in 1992. Additionally, the dance moves are a little more complex, allowing advanced dancers and lovers of line dancing to show off their skills. The moves for the dance consist of toe touches, steps to the left and right, and turns to the side. The dance moves for this song can be found in Chris Martell's video. The song can be downloaded from iTunes. One reason this dance is so popular is that it is set to the disco music Electric Boogie by Marcia Griffiths, and disco is a type of music that gets most people dancing. Additionally, it is popular due to its longevity: the choreography was first released in the 1970s! This means that most of your guests will be familiar with the song and dance moves. However, for those who aren't the moves are quite simple, consisting of four steps to the right and left, a step kick with a snap and a twist. These moves repeat until the end of the song. Victor Sho and LaShonna Holloway's Howcast video teaches the dance steps and a few variations to the Electric Slide. The music for the dance can be downloaded via iTunes. The theme of this song makes it perfect for a family wedding. Murphy Linedancing demonstrates the line dance moves for this song, which are made in a circle. The dance consists of corresponding hand and foot moves in the form of kicks and walking forwards and backwards. Find the song on Rhapsody and download it for listening with your account. As demonstrated by 4HFairfield members, this dance's moves to this line dance start with taping your right foot in front and back twice followed by a simultaneous kick and turn, and ending with a box dance step. The fact that many people recognize the music to this song, the song's upbeat nature and the fact that the dance moves are a little more intricate but still easy to follow make it a great line dance for a wedding. The music for this dance can be downloaded from iTunes. It's almost certain that every guest will be familiar with this dance. In particular, children will get a kick out of dancing along with everyone else to this silly song. The dance includes very few moves and, as ShizDiz DJ shows, mainly includes arm movements. The Chicken Dance song can be downloaded from Rhapsody. Line dances are easy: Most guests can pick up the moves merely by watching other guests for a few moments. Moreover, since most of line dances contain repeated movements, it's easy to continue dancing to the songs. Most line dances don't require extensive movements, making it easy for elderly and young dancers to participate. Line dances are fun: Guests love doing the same things as other guests, getting a kick out of the entire party acting the same. Get started with a bang: A line dance calls guests to a dance floor. Play a line dance early in your reception to make the dance floor more attractive. Have more than one: Unless you only like one specific line dance, don't hesitate to play more than one during your reception. In fact, having more than one line dance shows that you intentionally included the dance, and didn't do so reluctantly. Space them out: It's perfectly fine to have more than one line dance during your reception, but don't play them back-to-back. Spreading them out makes each stand out and makes it seem less like you are trying to force people to dance the same way for extended periods of time. Because of their relative simplicity, don't worry about whether a line dance is well known. Instead, select the line dance with the music or moves you like the most.